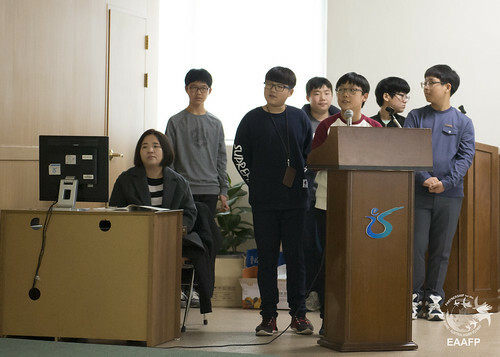 EAAFP has supported the Incheon Youth Research Club Activity Project, a citizen awareness raising program each year since 2014. This project was led by the local teachers environmental association with the aim to raising awareness of local students through nature research competition. EAAFP Communication Officer Tomoko Ichikawa participated in this project as a mentor. Incheon is a very important area for migratory waterbirds as it is located in a coastal area of the Yellow Sea with extensive mudflat. However, Incheon citizens awareness of their local environment is relatively low because historically, this city has been developed as an industrial base for the Republic of Korea. At the conclusion of the project for this year, the Youth Research Club Activity Forum was held on 26 November with the participation of students and mentors for the presentation of youth club research results for 2016. 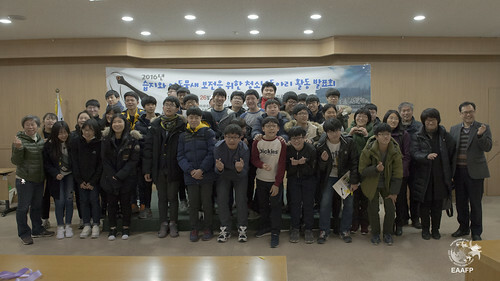 A total 10 youth clubs consisting of between 2 and 10 members in middle or high school participated and presented their research results, covering various nature-related topics, many of them highlighted migratory waterbirds, especially the Black-faced Spoonbills, in their local environment. The students made efforts to understand their local environment as they surveyed the status of birds, reptiles and plants and their habitats. Students tried to approach their survey and monitoring tasks in a scientific manner to understand more precisely elements of their local environment. One group has conducting a continuous monitoring on the water quality of the Namdong Reservoir which is a very important breeding site for Black-faced Spoonbills. 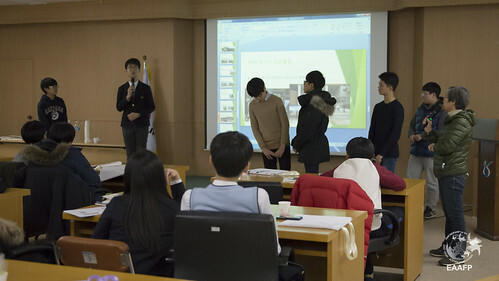 The presenter said that he will continue his research even after his graduation. One of the clubs designed and built a small pond as a model habitat and observed ecosystem changes in order to better understand the relationship between ecosystem and habitat, and realize how to care for the environment to make a rich ecosystem. A student of this club impressed the participants with his experience that he was able to commune with plant and animal while he caring of them during his research. Some students cultivated rice using environmental friendly practices by themselves and learned how the ecosystem could be diversified depending on the level of naturalness of the wetland. Other students chose the river and water reservoir near their school for their research area, and surveyed and analyzed which factors are affecting their environment and how to improve that degraded environment. Students agreed that the citizen’s awareness of the environment is important and discussed how to improve it. Most of the clubs passed down their research subjects to the younger members for the next year. In this way, they could continue to use their research results and knowledge to deepen and expand future work. I was very surprised and pleased to find out that they have significantly improved and grown up in the aspects of not only their awareness on nature but also their skills and abilities in accomplishing their research, delivering their opinions and working together effectively through their cooperative research, beginning with the first year of this project. We could believe that these young people are our potential resources and assets who will become strong protectors for our nature including migratory waterbirds and their habitats.